Panorama of Prineville in Crook County, and the Ochoco Mountains. Central Oregon is a geographic region in the U.S. state of Oregon and is traditionally considered to be made up of Deschutes, Jefferson, and Crook counties. Other definitions include larger areas, often encompassing areas to the north towards the Columbia River, eastward towards Burns, or south towards Klamath Falls. 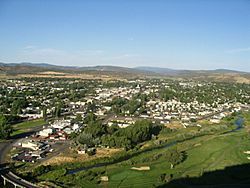 These three counties have a combined population of 153,558 as of the 2000 census, with Deschutes the largest of the three counties, having approximately four times the population of the other two counties combined. As of 2015, the most populous city in the region is Bend, with an estimated 87,014 residents. As defined by the three county definition, Central Oregon covers 7,833 square miles (20,290 km2) of land. Central Oregon has had 3 record tourism years beginning in 2012. Over 2.2 million people visited Central Oregon in 2012 and again in 2013. The region is located in the middle of the state with the Cascades to the west dividing the state from north to south, and the smaller Ochoco Mountains to the east. Portions of the region are part of a basalt plateau formed by the Columbia River Basalt Group, others are part of the slopes of the Cascades, and others part of the Basin and Range. The climate of the area is primarily arid due to the rain shadow effect of the Cascades on the western boundary of the region. Outdoor recreational activities, timber, and ranching are the primary economic activities. The Metolius River near Camp Sherman. The Central Oregon region covers approximately 7,833 square miles (20,290 km2), and sits at the convergence of the Basin and Range, Cascades, Blue Mountains, and Columbia River Plateau geologic regions. Because it is part of a historically volcanic region, volcanic rock formations are a common sight, including lava beds, volcanic buttes, crater lakes, volcanic plugs, and lava tubes. 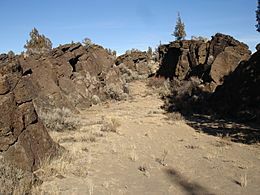 Consequently, Deschutes is the most cave-rich county in Oregon with over 500 lava tubes. The primary river flowing through Central Oregon is the Deschutes River. Its source is Little Lava Lake in the Cascade Mountains, northwest of LaPine. The Deschutes runs south to north, eventually flowing into the Columbia River. Along its way, dams control its flow creating Crane Prairie Reservoir and Wickiup Reservoir. The river runs alongside the resort community of Sunriver and through the city of Bend. It is tapped as a water source for the Central Oregon Irrigation District which serves agricultural and municipal users. As the river continues north, it flows past the Eagle Crest Resort and the city of Redmond. North of Redmond, the Deschutes River has cut a 300 feet (91 m) deep canyon. West of Madras, Round Butte Dam impounds the Deschutes River, creating Lake Billy Chinook. The two largest tributaries of the Deschutes are the Metolius River and the Crooked River. 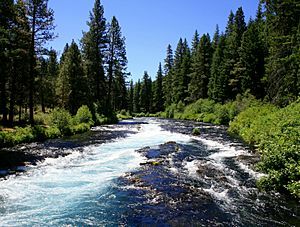 The Metolius begins at Metolius Springs and runs northeast, flowing into the Deschutes from the west just south of Round Butte Dam. The Crooked River flows west from its sources in the Ochoco Mountains and the Oregon high desert. It flows into the Deschutes from the east at Cove Palisades State Park. Both rivers merge into the Deschutes River, becoming part of Lake Billy Chinook, the reservoir created by the Round Butte Dam. The native plant life of Central Oregon can be divided between the Ponderosa forests at the foot of the Cascades, and the smaller Western Juniper forests to the east, with the Deschutes River being a rough boundary between the two. Because of the lack of precipitation, high temperatures, and lightning storms during the late summer, wildfires are a common occurrence. Small fires are essential, as they burn away detritus. With the arrival of European settlers, fire suppression became common. However, due to decades of fire suppression, several major wildfires have broken out and threatened large settlements. Major wildfires are becoming less common as the practice of controlled burns by local officials are more frequent. The Oregon Badlands Wilderness preserves the indigenous character, flora, and fauna of the desert basin and is located about 20 miles (32 km) east of Bend. The distribution of people in Central Oregon occurs mainly near its rivers. Most of its towns are built on riverside plains and between their surrounding foothills. Irrigation development in the region has made its otherwise arid flatlands useful for extensive hay production, farming, and livestock raising. Before European settlers arrived in the 19th century, Central Oregon was inhabited by the southernmost Sahaptin tribes and the northernmost tribes of the Northern Paiute. However, with the arrival of settlers along the Oregon Trail in the mid-19th century, both tribes soon found themselves at odds with the settlers and the U.S. Army. Peter Skene Ogden led a party of Hudson's Bay Company trapping through Central Oregon in 1826, becoming the first Euro-Americans explorers to visit the area. In 1843, Captain John C. Fremont and his Army survey team explored and mapped the western part of Central Oregon. Fremont was charged with mapping the Oregon Territory east of the Cascade Mountains from The Dalles on Columbia River to Sutter's Fort in Sacramento, California. The Fremont party, including Kit Carson and Thomas Fitzpatrick, camped near Bend on 4 December 1843. 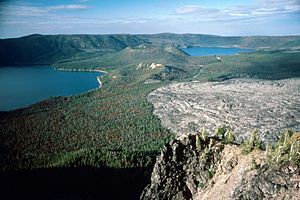 Newberry caldera at the Newberry National Volcanic Monument. In 1855, Secretary of War Jefferson Davis dispatched an Army Corps of Topographical Engineers' survey party to look for a railroad route from the Sacramento Valley in California to the Columbia River in the Oregon Territory. This required the party to survey the Deschutes River area in central Oregon. The survey party was led by two Lieutenants, Robert Stockton Williamson and Henry Larcom Abbot. Newberry Crater is named after John Strong Newberry, the party's chief scientist. In 1865, a Company of the 1st Oregon Volunteer Infantry Regiment led by Captain Charles Lafollett established Camp Polk. The fort was set up to protect early settlers from Indian raids. It was built 2.68 miles (4.31 km) northeast of modern-day Sisters. However, the post was soon abandoned. Not long after, homesteaders began to settle the region, making use of the wide open lands for ranches. In 1877, Prineville became the first city in the region, followed in 1888 by the founding of Sisters. In the early 20th century, several major highways were constructed in the region, connecting it to the rest of the state. U.S. Route 97 would connect the region to the Columbia River and Portland, and Routes 20, 22, and 126 to the Willamette Valley. Brooks-Scanlon Lumber Company in Bend, Oregon. In the first half of the 20th century, the lumber industry dominated Central Oregon's economy. By 1915, two competing companies had built large sawmills south of Bend. The combined output of the Shevlin-Hixon and Brooks-Scanlon mills made Bend one of the largest lumber producing towns in the world. In 1924, the Shevlin-Hixon mill alone processed 200,000,000 board feet (500,000 m3) of lumber. There were at least eight lumber mills in the Prineville areas as well. In the early 1930s, Sam Johnson opened a lumber mill in Sisters, the first of six Central Oregon mills the Johnson family owned over the years. During World War II, the demand for timber increased dramatically and Central Oregon mill towns went through a period significant growth. 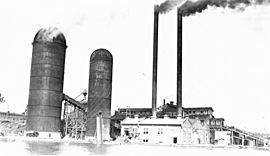 After the war, Johnson opened a large mill in Redmond. The Shevlin-Hixon mill closed in the early 1950s. Johnson’s Redmond mill was destroyed by fire in 1963, and the last mill in Sisters closed that same year. In 1967, Johnson sold his last mill at Warm Springs to the Warm Springs tribal council and provided additional plywood and veneer-making equipment to help the tribe establish Warm Springs Forest Products Industries. The Brooks-Scanlon Lumber Company sold their remaining timber land in the 1980s. Ponderosa pines in the Ochoco National Forest. Unlike the wetter regions west of the Cascades, plant and animal life is less diverse but hardier due to the arid nature of the region. Plant life, though not suitable for truly arid regions to the south, have evolved several defenses against water loss, as well as adaptions related to the yearly fires that burn through the region. Trees, such as the ponderosa pine, have thicker bark and do not bleed sap as profusely as trees to the west. Likewise, this thicker bark doesn't burn very easily. In fact, the ponderosa requires small brush fires to burn through, as their cones are opened by the heat of the passing fires. Likewise, plants such as the black sagebrush and cheatgrass occur frequently within the region, especially among the shorter western juniper. There are also many different species of wildflower. Central Oregon has a wide variety of habitats including mountain high country, conifer forest lands, riparian areas, high desert, and alkali flats. These habitats are home to many animal species. Common large mammals include American black bear, cougar, bobcat, coyote, gray fox, red fox, mule deer, black-tailed deer, Rocky Mountain elk, pronghorn, and bighorn sheep. Examples of smaller mammals found in Central Oregon are beaver, raccoon, weasel, otter, mink, fisher, marten, striped skunk, black-tailed jackrabbit, mountain cottontail, pygmy rabbit, golden-mantled ground squirrel, and least chipmunk. Twelve species of hawks and eagles are found in Central Oregon. There are also five falcon species. These birds of prey include bald eagle, golden eagle, northern goshawk, northern harrier, red-tailed hawk, American kestrel, prairie falcon, and peregrine falcon. There are thirteen owl species, including barn owl, barred owl, boreal owl, burrowing owl, great gray owl, and great horned owl. Turkey vultures are also common. Central Oregon is home to seven woodpecker species, including downy woodpecker, hairy woodpecker, and Lewis's woodpecker. Northern flickers are found in the Central Oregon woodlands. There are a number of smaller birds as well. These include various larks, tanagers, swallows, jays, crows, chickadees, wrentits, dippers, nuthatches, wrens, thrushes, and grosbeaks. 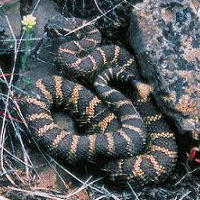 There are nine snake species found in Central Oregon. These include western rattlesnake, gopher snake, rubber boa, northwestern garter snake, and common garter snake. There are also numerous turtles, lizards, and frogs native to the region. These include western pond turtle, common collared lizard, northern alligator lizard, sagebrush lizard, short-horned lizard, western fence lizard, western skink, bullfrog, and Cascades frog. Historically, the local rivers have also been populated by several species of Pacific Ocean salmon. However, because of the numerous hydroelectric dams on the Columbia, there has been a reduction in the number of ocean-going species of fish. Because it sits in the rain shadow of the Cascade mountains, the climate is dry and sunny. The climate varies some among Central Oregon communities, but will see approximately 300 days of sunshine a year, which is the areas real draw. Summer temperatures range between 45 and 85 °F (7 and 29 °C) and winter months average between 20 and 40 °F (−7 and 4 °C). Precipitation falls mostly in the winter season as snow, which ranges from 8 to 22 inches. Winter snowfalls are also dangerous. Snowfalls quickly build up layers of ice as it begins to melt and refreeze daily over the months of December and January. This means that the snow is heavier and more solid, making it difficult to plow. The Deschutes National Forest contains about 104 developed campsites. Many of these are right outside Bend off the Cascade Lakes Scenic Byway. Todd Lake is the first off the Cascade Lakes Scenic Byway. The campground only has 3 walk in sites and they are no reservation. This lake is known for the hiking and beautiful scenery with views of Broken Top. It is home to the Cascades Frog and the Western Toad, which are threatened species. While camping here, visitors can take part in hiking, fishing, and horseback riding trails. These camp site has no running water but do have toilets. Located further down on the byway, Sparks Lake has views of Broken Top, South Sisters and Mt.Bachelor. The camp grounds are close to the lake off Soda Creek. It is accessible with a small vehicle and is primarily for tent camping. Fishing and hiking are the two main attractions to this campground. The campground has fire rings, picnic tables, restrooms and trash cans. The fee is approximately $10.00 per night. Spark Lake is a trout lake, primalled with cutthroat trout and occasionally brook trout, as it used to be a fishery for them. Visitors can fish from shore or boats. Both motorized and non motorized boats are allowed with a maximum speed of 10 miles per hour. Sparks Lake is a fly fishing only lake. Soda Creek Trail and Green Lakes Trail are the two popular hiking trails near by. The Soda Creek Trail can be done as a day hike, although it is a primitive trail and does not have bridges over streams. Green Lakes Trail is known for backpacking and goes up through Broken Top and South Sisters. This campground is also on Elk Lake, but is more secluded. It has 20 single sites and 12 group sites to accommodate larger parties. The facility has two CXT toilets and a pump for drinking water, along with picnic tables and campfire rings. These sites can be reserved but are otherwise on a first-come, first-served basis. There is day use beach and boat ramp for lake access. This campground is only open during the summer months when the snow has melted as there is no winter access. 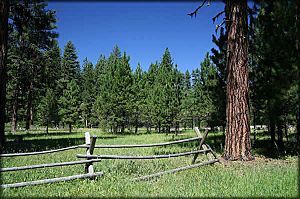 Hiking and horseback riding are popular activities off this campground on the Elk-Devils Trail which goes all the way to the Wickiup Plains Trail. Located on Hosmer Lake, this campground offers 15 single campsites. This facility has vault toilets, but no access to drinking water. Each site has a picnic table and a fire pit with grill. There is a pay station on site and averages $10.00 per night. The main attractions of this campground are hiking, fishing, canoeing and kayaking. It is stocked with Atlantic salmon and has many brook trout naturally, however fishing is limited to catch-and-release fly fishing with barbless hooks. With views of Broken Top, Mt.Bachelor, and South Sisters, Hosmer Lake Campgrounds are a great place to explore and enjoy the scenery and wildlife. This is the sister campground to Mallard Marsh and together they are often known as the Hosmer Lake Campgrounds. This facility features 23 sites that are RV, trailer or tent friendly. There is also a boat ramp that provides access to Hosmer Lake. There is also no water here so campers must bring their own. Fly fishing is a popular pastime in Central Oregon. A winter sunrise at Mount Bachelor in Central Oregon. Central Oregon Facts for Kids. Kiddle Encyclopedia.